DogSheetz Dog Blanket is the first dog blanket that is totally waterproof! 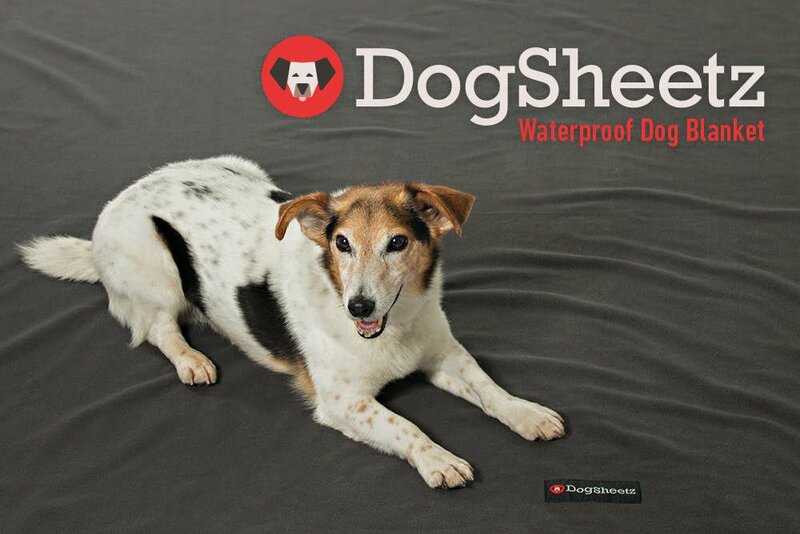 Cover a mattress, couch, car seat, or just about anything your dog lays on and enjoy total waterproof protection. The size of the waterproof dog blanket is 50” x 60” inches. Wash in cold water with NO bleach and light detergent. Use low spin cycle to keep from damaging the barrier layer in the fabric. 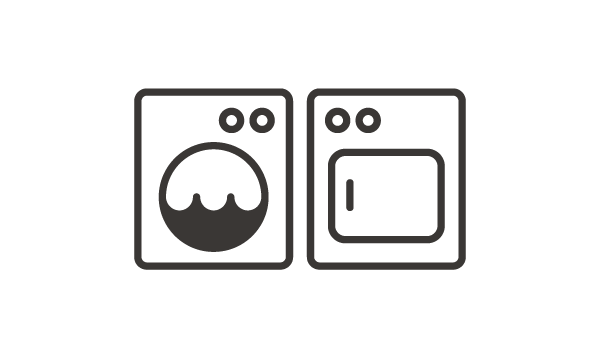 For drying: lay flat to dry is the best, but you can tumble dry on the lowest heat setting. We have re-engineered fleece! 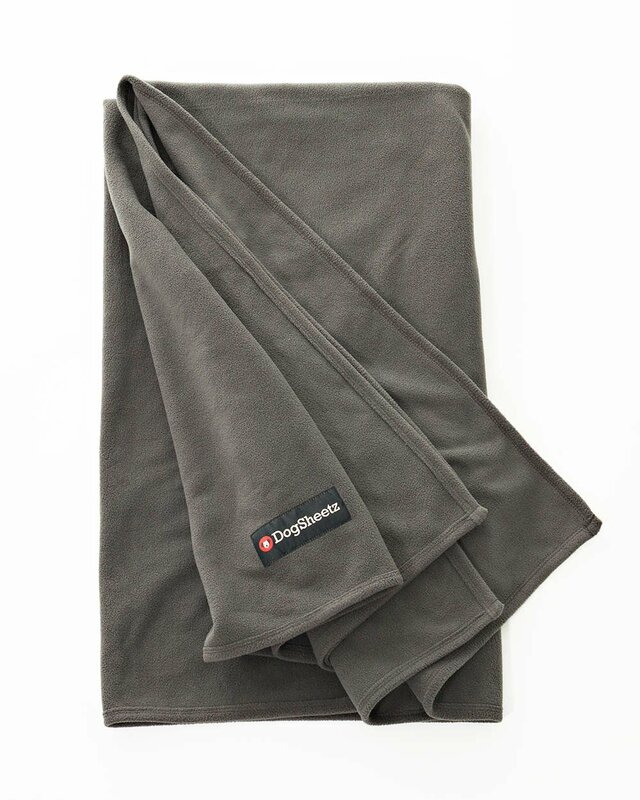 The DogSheetz Blanket feels like a luxurious ultra fine fleece to the touch. 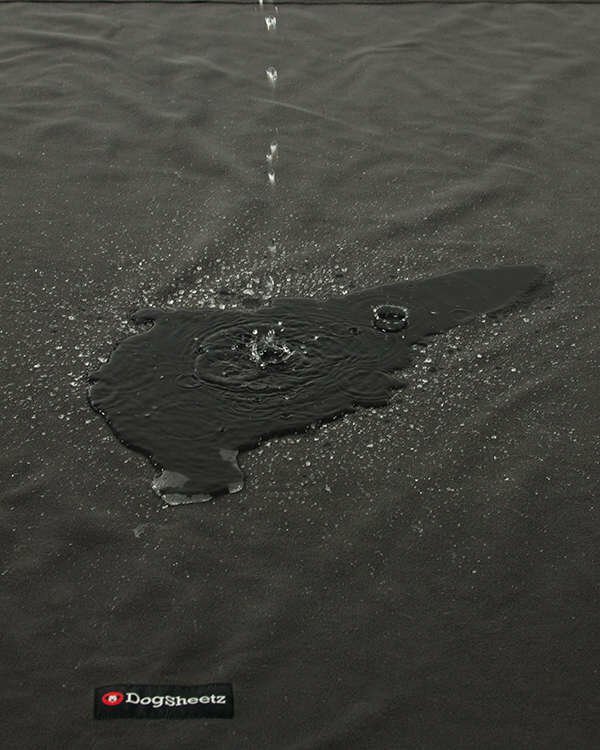 The waterpoof barrier is built into the material and is not a liner. Unlike other waterproof barriers out there, there is no space where the liquid will be caught in between layers of material. The DogSheetz Blanket is an all-in-one waterproof dog blanket. Dogs love the softness and being able to "nest" down into their bed, keeping them warm and comforted! What are the dimensions of the DogSheetz Waterproof Dog Blanket? Is the DogSheetz Blanket really Water Proof? Yes! We test the fabric by putting a jet of water against the fabric and blast it, ensuring NOTHING goes through. We are happy to tell you, our fabric does it perfectly! 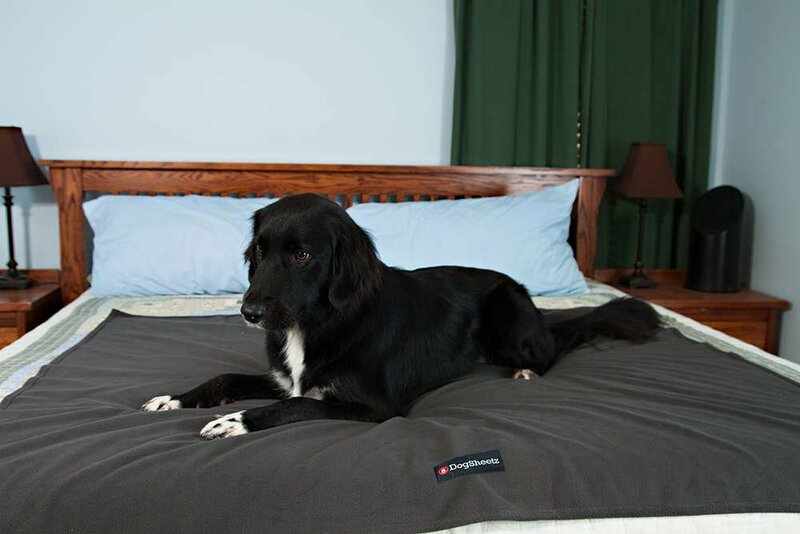 In addition, our DogSheetz waterproof dog bed cover is naturally water resistant and odor resistant due to the fabric we use and NOT because we treated the fabric with (bad for the environment) chemicals. There is a difference between Water resistant (beads up on the surface) and waterproof (has a barrier to prevent liquid going through), our DogSheetz does both. Patent Pending. How easy is it to clean the DogSheetz Blanket? Very easy! When it's time to wash your DogSheetz Blanket, just pop it in the wash! Wash in cold water with NO bleach and light detergent. Use low spin cycle to keep from damaging the barrier layer in the fabric. For drying: lay flat to dry is the best, but you can tumble dry on the lowest heat setting. Do you have any other colors other than grey? The first production run will only include the neutral color of grey. In the future we will expand to more designs and colors. Is the DogSheetz Blanket chew proof? At this time, the original DogSheetz Blanket is not designed to be chew proof. However, we have seen dogs leave it alone due to no seams are exposed and therefore the fabric is not as irritating for a dog to get at a weak spot in the fabric to start chewing. Is the DogSheetz Blanket Hypoallergenic? Yes! 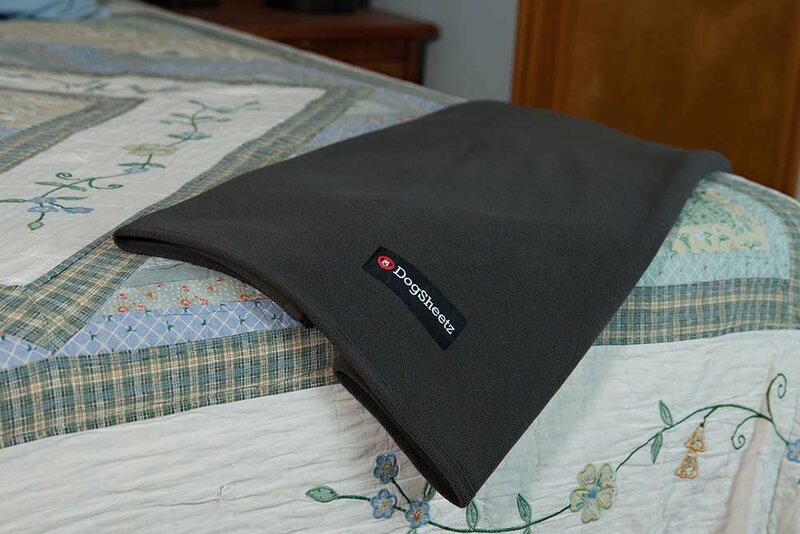 The DogSheetz Blanket creates a barrier between your pet and the dog bed stuffing that keeps the mites away! 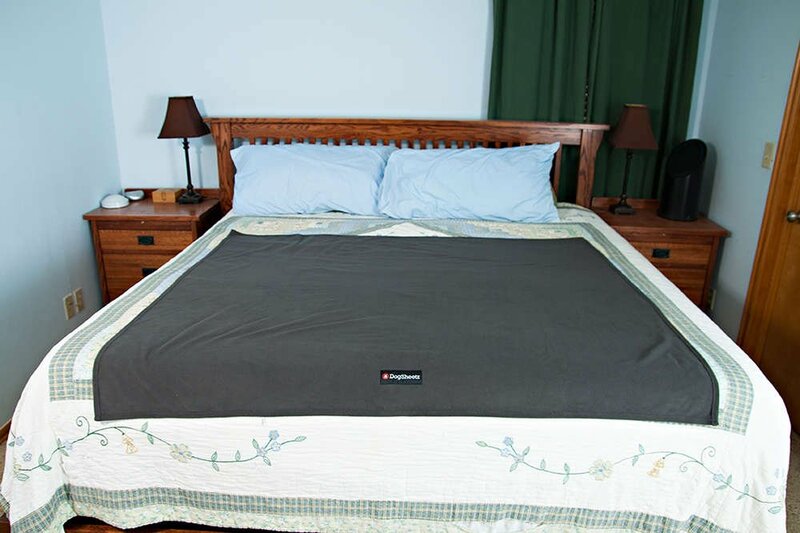 The DogSheetz Blanket is also made with no chemical treatment or layer that makes it water resistant, it is naturally water, stain, and odor resistant due to the fabric we use. It is waterproof due to construction of how the fabric is built. Finally! I was just thinking the other day I needed this, how did you come up with this? It all started when one of my dogs had a kidney infection and he suddenly needed to pee. Rowdy didn't even make it out of the bed before peeing everywhere. Of course I couldn't get upset but I was aggravated that my dog bed didn't have a cover to remove, plus it wasn't waterproof. In addition, the waterproof liners on the market today are very uncomfortable. So I set out to find a fabric that would comfortable but protect the bed's filling so it can last longer. Viola! DogSheetz was born! I like supporting small business, are you small business? Yes! We have 3 employees including the owner. We are based out of Norman, Oklahoma and have 8 testing dogs on staff. The blanket is large, soft, and does not let moisture in. I will be buying another one, great value and a great product. Perfect for our large, messy, couch-potato dog! We previously got a cover for our couch that draped over the back and arms and it was hideous. The rubbery underside of it was damaging the couch fabric and I found out the hard way that it wasn't waterproof. I can't believe I went this long with that stupid thing before finding DogSheetz. We LOVE it! We spread it out on the cushions and tuck it in and it doesn't budge with all our moving around. It works perfectly. If someone comes over, we just untuck it and toss to the side like any ol' blanket. It's super soft which we love, and the material is strong and definitely waterproof. I am SO glad I found this! I love this dog sheet. I travel in my RV a lot with my dog and this is a fabulous cover for the bed. I also use it in hotel rooms and on the back seat of my truck. It has a thousand uses and has been an invaluable addition to our collection of Really God Pets waterproof products including the dog bed covers. We have an issue with one or more of our cats peeing on the bed and now, with a new puppy in the house, peeing on the dog bed. We've tried other "waterproof" blankets on our bed, but I'm constantly washing the "waterproof" blanket and our comforter after pet accidents. NO MORE! It didn't take long for the blanket and the dog bed cover to get tested, and they both scored a perfect score! I am ecstatic and would definitely rate the Dogsheetz blanket and the Dogsheetz dog bed cover 30 stars. I do wish the blanket came in a larger size since we have a Cal-King bed. Anyway, I only had to wash the blanket and dog bed cover...the comforter and dog bed were unscathed thanks to the true waterproof quality of Dogsheetz! The dog bed cover has a spot where I sprayed a cleaner on it so the fabric now is changed in texture (a bit shiny vs. fleecy), but I think I would've been fine washing it without the spray. I am going to order a second cover for our other dog bed. Thank you, Dogsheetz!